Bot Thoughts: Edward Isaac Bot 3D! A blog of robotics, electronics, mechanics, programming, and engineering. Pictures, source code, circuit diagrams, ideas, thoughts, drawings, sketches and real-life goofups. 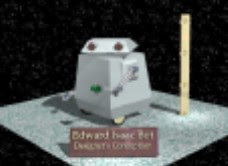 Here's a 3-d ray-trace rendering of Ed the robot done years ago. Sorry for the low res, but screen res wasn't so great back then. The gold marker indicates ~ 2.5' height. Quick and Dirty Compass Calibration in 3d! Copyright © 2007-2013 by Michael Shimniok. Picture Window theme. Powered by Blogger.